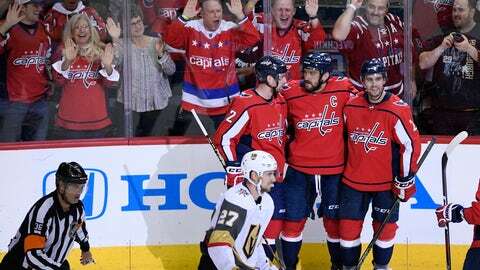 WASHINGTON (AP) — Evgeny Kuznetsov continued his dominance against the Vegas Golden Knights, scoring a goal and assisting on three more as part of a 5-2 Washington Capitals victory Wednesday night in a rematch of last season’s Stanley Cup Final. Coming off a 49-goal season and a Conn Smythe Trophy as playoff MVP, Ovechkin has four goals in three games. The 610th and 611th goals of his career put him in sole possession of 17th on the NHL’s career list, passing Bobby Hull. Braden Holtby stopped 29 of 31 shots and bailed out his teammates during an especially sloppy second period. Holtby allowed goals to Cody Eakin in the second period and Reilly Smith in the third. The Golden Knights fell to 1-3-0 at the beginning of their second season. They didn’t lose their third game in their inaugural season until Halloween when they started 8-3-0. ANAHEIM, Calif. (AP) — Nick Cousins scored in the shootout, Antti Raanta made 23 saves and the Coyotes earned their first win of the season. OTTAWA, Ontario (AP) — Jakub Voracek and Scott Laughton scored two goals apiece, and Philadelphia rebounded from an embarrassing loss to beat Ottawa. Sean Couturier, Robert Hagg and Claude Giroux also scored for the Flyers, who were coming off an 8-2 loss to the San Jose Sharks in their home opener a night earlier. Calvin Pickard stopped 31 shots. Brady Tkachuk scored his first NHL goal and finished with two goals and an assist for Ottawa. Maxime Lajoie also had two goals and an assist for the Senators, who were playing the first of a five-game homestand.